What you need to evaluate and how to do it. What Does the Author Know? Where Did the Author Get the Information? Was the Source Reviewed for Publication? Why do you need to evaluate? It's one of your jobs as a college student. But...fake sites, propaganda sites, sites that lie. Even books and articles may not be objective. With stuff like this going on how are college students supposed to know what is true and what isn't? Your instructors expect you to be able to determine what sources are appropriate for college level research, as well as what is appropriate for your specific assignment. To determine this you will need to evaluate your sources. Open access sources are a special concern for your instructors because there are so many diverse organizations and individuals publishing Web pages. There is no screening process. You will be responsible for evaluating the sites you use. Books and periodicals in the library have gone through at least two screening processes: someone had to decide that the work was publishable; someone had to decide the work would be of value in the library’s collection. Even so, not all books and articles are suitable for your research. Even books and articles can be biased and once in a while things get published in print that aren't true. So--you know you need to evaluate the sources. But how do you do it? Use the tabs above to see 5 questions you should answer to evaluate your sources. What does the author know about the subject? Has the source been reviewed for publication? Who does not love Wikipedia? It's fast, it's easy, it's got everything. Sadly, though, it does not come up to college level research standards. It's a great example of some of the best and worst of the web. In case you don't know, Wikipedia is a free encyclopedia that anyone can edit. Some entries are written by experts with lots of detail; others are written by people who don't know very much about the subject, are deliberately misleading you or are added as a prank. Theoretically, over time, the inaccurate stuff will go away. Eventually the goal is to publish it in print, and it may end up being the best encyclopedia ever written--time will tell. Meanwhile there is still stuff in Wikipedia that is inaccurate. 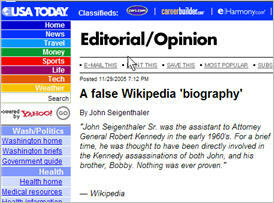 In fact, an entry had to be removed from Wikipedia that was false: John Siegenthaler Sr. was listed in Wikipedia as having been a suspect in the JFK assassination. This was not only untrue, but slanderous. Read the editorial Siegenthaler wrote in USA Today about it or this Wikipedia entry, Wikipedia Seigenthaler biography incident. Stephen Colbert edited Wikipedia live on The Colbert Report until he was finally banned by Wikipedia. See Colbert speaks, America follows: All hail Wikiality!. In response Colbert created a mock site: Wikiality, The Truthiness Encyclopedia. Watch the video, below. In a Chronicle of Higher Education article, Wikipedia founder Jimmy Wales, states that he continuously gets emails from college students complaining that they have failed their papers because the information they found in Wikipedia was inaccurate.